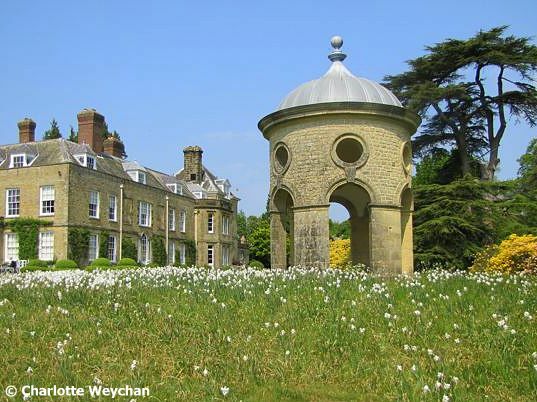 This month saw the opening of a 20th century garden set within an 18th century landscape that looks set to become one of the most popular gardens in Britain ... if you can get there! 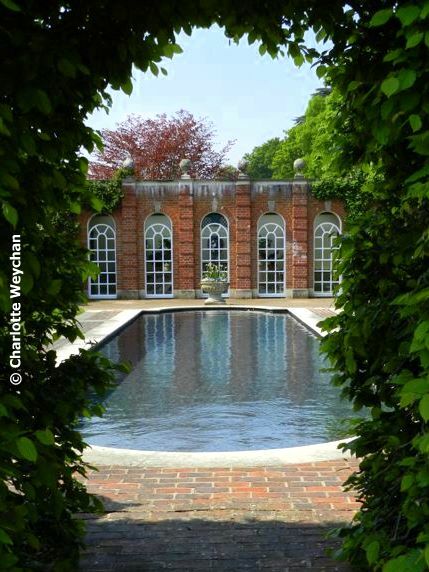 Woolbeding House in West Sussex is the newest National Trust garden to open its doors to the public and I was lucky enough to visit last week. It's a remarkable property and I'm sure it will draw visitors from all over the world, once they hear about it. But first you have to get there! There is no car parking whatsoever at the property except for disabled visitors who must book ahead. All other visitors must take advantage of a minibus shuttle service, or walk there. So first things first - unless you are planning to walk to Woolbeding, you can only visit this property by booking ahead - to do this, call Anna on +44 (0)1730 825415. Good luck because the number is nearly always engaged! But do keep trying because I was enchanted by this garden and hope this post will tell the story of what you'll find there if you visit. 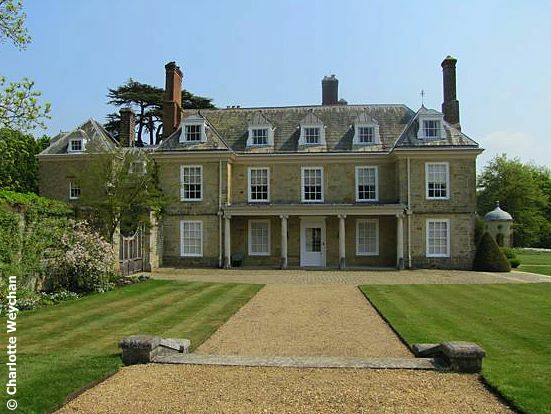 Woodbeding House (top) is an attractive and well-proportioned Grade I listed mansion that was transferred to the National Trust by the Lascelles family in 1958. It was then leased to Simon Sainsbury (later Sir Simon), well-known philanthropist of British supermarket fame and his lifelong partner Stewart Grimshaw, who moved here in the 1970s. 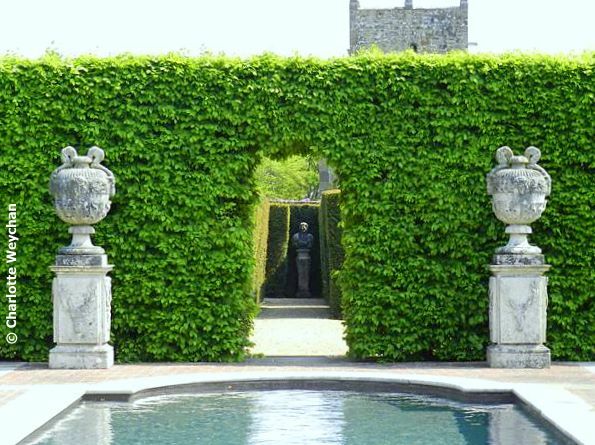 The garden, as we see it today, is their legacy and a result of their association with both Lanning Roper, the well-known American landscape gardener and journalist; and garden designers, Isabel and Julian Bannerman. 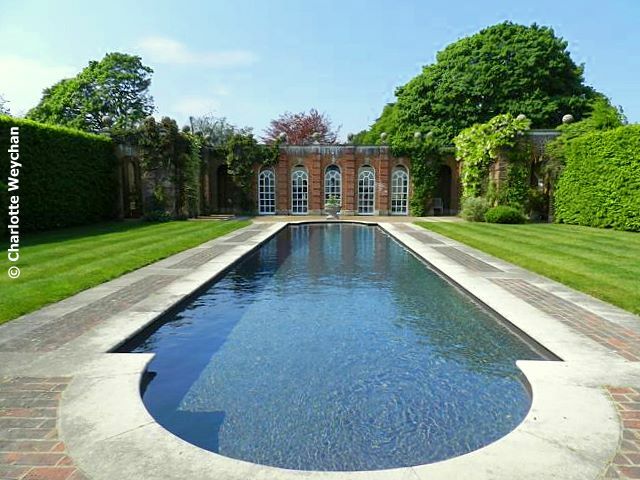 For a full history on the house and important garden features, see the UK Parks and Gardens entry on the property. Sainsbury died in October 2006, but agreement was reached between the NT and his surviving partner, Stewart Grimshaw that he should continue to live at the property, providing the garden and grounds opened to the public. The house is not open and many of the contents were sold at auction in 2008 in a Christie's sale. But the gardens at Woolbeding are a veritable jewel in the NT crown - split into two very distinct areas - those surrounding the house - shown here today and the very different gardens across a flower -strewn meadow, which I'll feature next. Once you've walked past the front of the house and admired the folly, which was created in 1987 to replace a massive Tulip Tree (Liriodendron tulipifera) blown down in the Great Storm the year before, you arrive in the Well Garden, which gives you access to the Herb Garden. 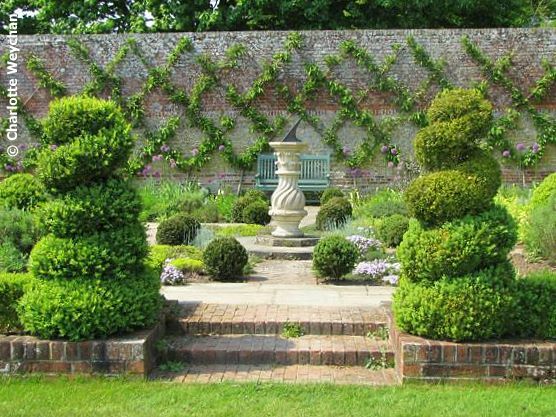 The planting throughout is immaculate and complimented by decorative circular brickwork around the well, box-edged borders, spiral box topiary and carefully trained fruit trees in diamond shapes. 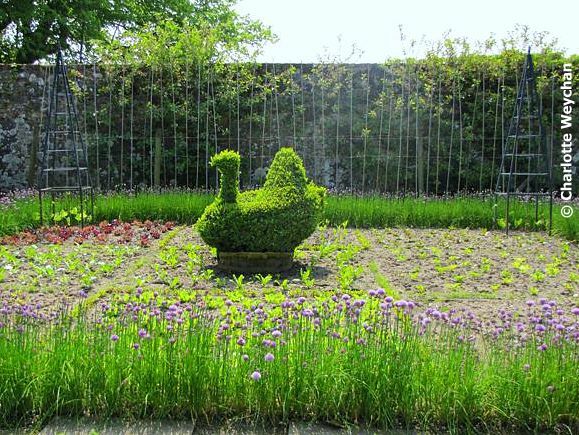 The Vegetable Garden is presided over by a topiary chicken and will no doubt turn into a vegetarian paradise in the months to come. This garden gets better and better as you move through the series of interconnected garden rooms, which are divided by tall, immaculately clipped hedges. First glimpsed through the opening of a hedge (left) and framed like a picture, you see The Orangery for the first time, overlooking a long pool flanked by perfectly-mown lawns. But the great joy of this property is that although the garden has only just opened to the public, the trees, hedges and climbers are already well established, thanks to the foresight of Woolbeding's residents, Sainsbury and Grimshaw, who were both passionate about their garden. Work began on the garden as it is today, when Lanning Roper became involved as landscape architect, and then Julian and Isabel Bannerman joined the team. 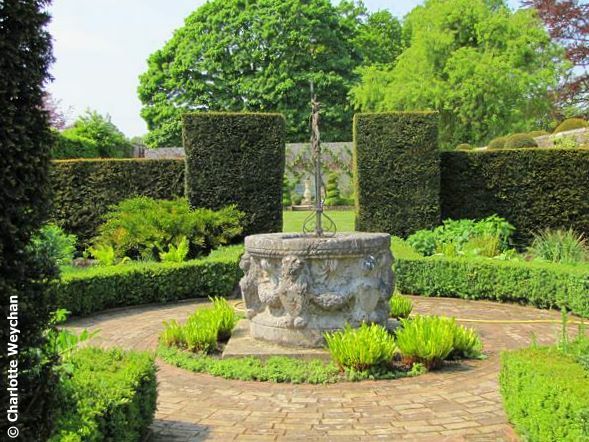 The Bannermans have their own remarkable garden at Hanham Court near Bristol, which I hope to visit in the next couple of weeks, but have also been involved in other notable gardens including Arundel Castle and Highgrove. Woolbeding Garden is open on Thursdays and Fridays, from 10.30 - 16.30 until the end of September. This is definitely a property to add to your Wish List, even if you do have to make a considerable effort to get there. I'll be watching its progress carefully and hope to return there on foot again soon! In Part 2 I'll cover the water gardens that nestle in the valley - gardens so different to those featured today you'll be amazed! This is indeed an enchanting garden. The buildings almost seem a part of the garden. Thanks for the tour. Love all the photos of this one garden. It really made me want to visit it if I ever get to England again :(. Thanks so much for posting. The garden looks splendid. In its whimsy, it reminds me a little of West Green House. I look forward to part 2 of your report! Thanks for info. Another one to visit. Great pictures as always. What a gorgeous mansion, and as for the garden, no wonder you were so taken with it. I also am looking forward to part 2.